Speeding and Drunk Driving: Do You Know which is Worse? We all know how dangerous drunk driving can be, yet it continues to be a serious problem, causing over 10,000 deaths each year, or about one-third of all car accident fatalities in the U.S. Drunk driving is a serious crime that is severely punished and universally met with moral outrage. Yet there is another driving behavior that takes an equal number of lives every year, only this one is done by the majority of drivers every day and is rarely punished with little more than a fine. Read on to learn about just how dangerous speeding is, and contact an experienced Palmdale personal injury attorney if you or a loved one has been hurt in a car accident with a speeding or negligent driver in the Antelope Valley. Last year the National Transportation Safety Board released a safety study aimed at Reducing Speeding-Related Crashes Involving Passenger Vehicles. The report found that between 2005 and 2014, speeding was a factor in 112,580 fatal car crashes in the U.S., or 31% of all fatal car accidents. Alcohol, by comparison, factored into 112,948 fatal accidents over the same period, just 368 more deaths than those caused by speeding. In a press release issued by the Governors Highway Safety Association commenting on the study, Executive Director Jonathan Adkins referred to speeding as a “forgotten issue,” lacking the same social stigma as drunk driving yet clearly just as deadly. As the NTSB study points out, speeding increases crash risk in two separate ways. 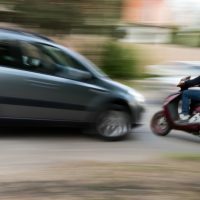 First, speeding increases the likelihood of being involved in a crash, since a speeding car requires more time and distance to stop than a slower car. A speeding driver who suddenly encounters a traffic slowdown or an object in the road will be less able to stop in time or take a safe evasive maneuver without losing control of the vehicle. Secondly, a crash involving a faster-moving car tends to involve much more serious injuries than a crash involving a slower-moving car. Force and speed are related in such a way that the speed of both moving cars combines to heighten the impact of a crash. Not only are speed and force related, but the relationship is exponential, so that just a small increase in speed causes a large increase in the force delivered on impact. Drivers can be reckless or negligent in a number of ways, including distracted driving, speeding and drunk driving. If you have been hurt in an Antelope Valley car crash caused by the negligence of another, talk to an experienced personal injury attorney about pursuing a claim for damages against the negligent driver by calling the Kistler Law Firm in Palmdale at 661-206-6990. Paul M. Kistler focuses his legal practice in the areas of personal injury law. Serving Lancaster, California and nearby cities in the Antelope Valley, he is a local attorney who truly knows his community and its people. © 2017 - 2019 Kistler Law Firm, APC. All rights reserved.